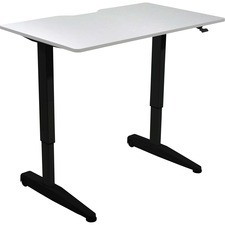 Adjustable-height desk easily helps you achieve a comfortable working posture while sitting or standing. It promotes cardiovascular health and alleviates back pain. Elegant design fits into any working environment. Airlift-pneumatic height adjustment means no electricity needed and no cable clusters. Just a touch of a lever adjusts the desk from 29"" to 46"" high. Free of cords, the two rolling casters allow easy mobility. Pre-assembled base and lift components allow quick, easy setup. Robust design includes a rectangular silver gray worksurface, solid steel column frame, steel crossbar and cast metal legs for a sturdy feel at any height. Textured wood top with beveled edge features a built-in cable corral and pre-installed screw inserts for easy assembly. Static load capacity is 220 lb. Dynamic load capacity is 20 lb.